Belmonte is known in part for his skill at trick shots, and they come in handy here. The spot—from directors Ben/Dave (Ben Hurst and Dave Thomas)—is styled as an infomercial, with Belmonte performing never-before-seen trick shots in front of a live audience. Set up on the bowling lane are typical Saturday night scenes—a bar, a restaurant, a nightclub—which Belmonte bowls right through, to cheers from the crowd. 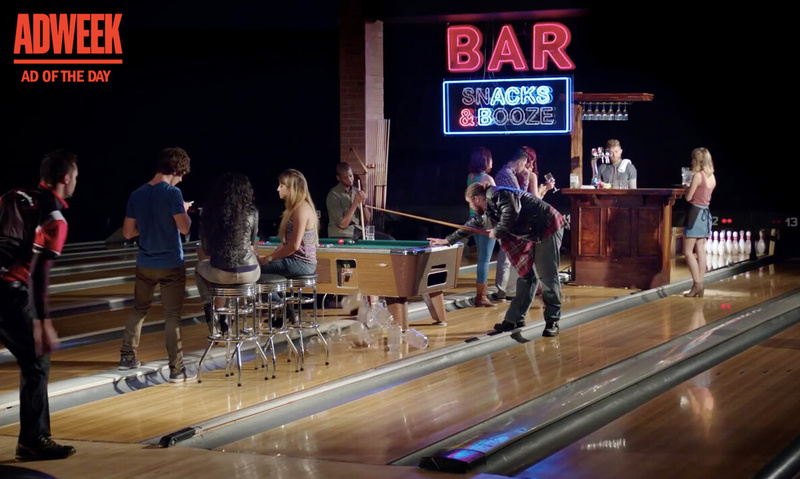 Bowlmor AMF, the largest operator of bowling centers in the world, is targeting millennials with this campaign. Its previous campaign was the first national advertising campaign for a bowling center brand in over 40 years. This one carries the simple message that you don’t have to do the same mundane things every Saturday—that you can break your routine for a fun night of bowling. The new campaign will span TV and digital, including ESPN and Bravo as well as Hulu and YouTube. The campaign launches today, and spots will air throughout the fall in both 30- and 60-second units.